He ordered great tables to be placed under the trees and spread with rich food. When he and his nobles sat down to dinner, crowds of people stood around to look at the great king. Many of them were poor and hungry, and Charlemagne ordered his servants to give them bread and meat from the tables. so the little boy went out to see if he could find any wild fruit to take home. Seeing a crowd of people hurrying along, he followed them. 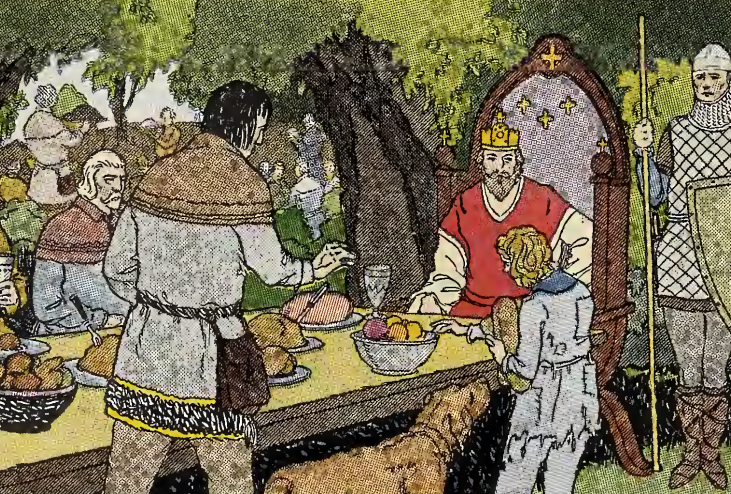 When Roland saw the tables spread with food, and servants handing bread and meat to the people, he was so surprised that he could not move. It was a wonderful sight for a hungry boy. "And all this is to be given away!" he thought. "Now Mother will have a good dinner!" He did not wait for anyone to give him the food, but walked straight to a table and gathered up as much as he could hold in his arms. Everyone looked in surprise at the beautiful boy in the strange clothes, who fearlessly took bread and meat from the king’s own table.